We provide objective, scientific and research based Occupational Therapist Medical Driving Assessments, which are approved by NZTA. 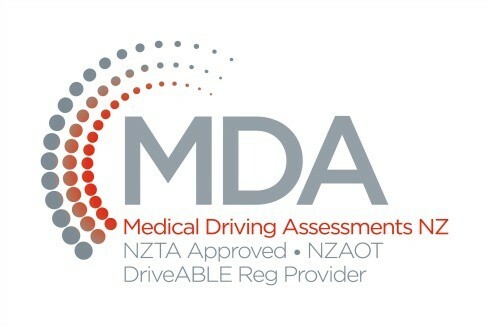 The NZTA OT MDA requires both cognitive and on road components, involving an NZTA registered instructor and a specialist NZ registered Occupational Therapist who is approved by NZTA. Lower ACC and Insurance levies. How will their driving standards and competency effect your ACC Levies? please call us as we will be happy to customise an individual solution for you. Cognitive On Road Evaluation” This course is based on the NZTA Road Code and the DriveABLE scientific and research based assessment. This course includes a 3 hour theoretical base, followed by individual practical driving and cognitive evaluation. Driver failed the course? – If a driver is deemed not safe to drive, customised lessons are provide, where applicable and on request. the individual concerned. We can provide customised driver tuition. Learner Drivers – get the correct tuition at the outset for lifelong skills to be a safe driver. For experienced drivers who may have lost confidence due to injury etc, current drivers and those wishing to learn to drive. Rehabilitative and corrective lessons for those who have failed an OT Medical Driving Assessment or NZTA Driver Licence tests. If you do not find a SERVICE which meets your particular requirements, please call us as we will be happy to customise an individual solution for you. Refresher and Corrective Driving Course for senior drivers. Up skilling driving lessons for experienced drivers post injury / illness / loss of licence/ loss of self-confidence. Driver Risk Assessment may be required. Social(home based), you will be visited in your own home, when requested to do so by you. Have your needs for living at independently in your own home changed due to age illnes or injury? Immigration – Does the new applicant meet NZ Immigration medical and personal independence standards required for NZ residency? Vocational(work based). You will be visited at your place of work, in consultation with you and your manager. OOS/ RSI questions? High rate of absenteeism or staff turnover? Adaptive Equipment consultation and prescription of equipment – for work, home and vehicles. Medical fitness to drive assessment. driver, in making the decision whether or not they are able to drive safely in urban or rural settings. To make an appointment call Anne on 021 1380124 or go to Referral or Contact Us – fill in your details and leave a short message of your concerns. I will contact you as soon as possible, to discuss your concerns and make an appointment if required. New Zealand wide – referrals accepted from anyone wishing to have an objective, scientific evidence-based medical driving assesment, from anywhere in New Zealand – Contact Us. including vehicle modifications, both here and previously in the UK. The Standards of Practice for Occupational Therapy in New Zealand are applied. These assessments are to ensure a person is as independent as possible in their living environment, and to assist in planning for their future. Equipment can be prescribed as appropriate, with time frames suggested where necessary, in order to promote safety, effective injury management and ongoing independence. The assessment tool DriveABLE is the only such driver assessment available worldwide, and is used in Canada and USA, NZ and Australia. Soon to be introduced in UK and Europe. The assessment has two components – off road (DCAT)and on road (DORE). It takes approximately 1.5 – 2 hrs. COURSES – The Occupational Therapy Medical Fitness to Drive Assessment and Road Code Evaluation with Advanced Driving Skills Course is NZTA approved. All Driver Risk Evaluation and Advanced (or learner) Driving Skill courses are NZTA approved. Clients referred by: NZTA NZ Police WINZ ACC CADS Immigration NZ DHBs Medical Professionals Alzheimers Association, Stroke Foundation etc Insurance Companies Corporate firms Transport firms Hospitality firms and many private individuals also request this service to assess potentially at risk medically unfit drivers, and drivers who may need upskilling in vehicle control and road code adherence.